The Cubs number one pick in the 2007 amateur draft was a hitter/3rd baseman, Josh Vitters. 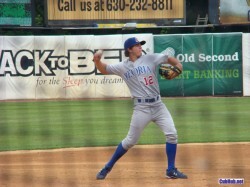 He is presently hitting .321 with 13 HRs for the Peoria Chiefs (A-ball minor league affiliate). Last weekend the Chiefs were in Geneva IL playing the Kane County Cougars. I went to the game to take a look at the future of the organization. The Chiefs lost to the Cougars on June 7th 7-1, mostly due to lousy pitching. 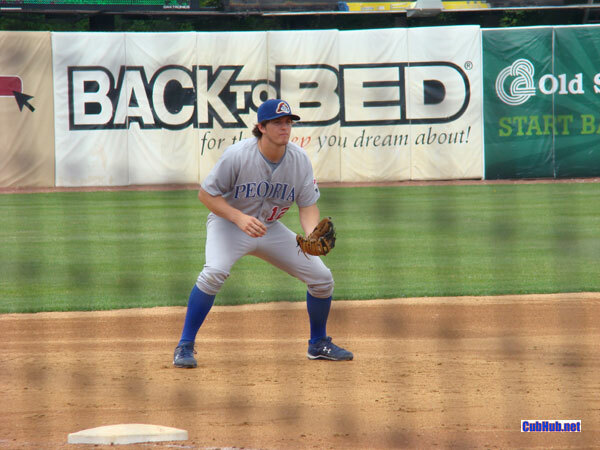 Admittedly, I haven’t seen much minor league ball in person but what struck me was how much slower the game was. The balls really weren’t very hard hit. The plays not as much of a given – nothing flashy at all and even routine plays weren’t for sure. I guess I expected a higher energy level from the players too. Each inning they would walk onto the field instead of run. And basically they seemed to move very deliberately. This was all unexpected to see. The energy level in the stands seemed higher than on the field. Get your energy level pumped back up while betting online. You can find the best odds and make extra cash. So I watched Vitters in action. He seemed pretty quiet, reminding me in a way of Ryne Sandberg. I did not see him interact with anyone on the team while he was on the field. He seemed to be pretty much flat footed between pitches. 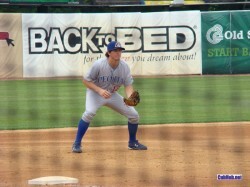 Vitters made a couple of routine plays at third, no big stretches, no tough throws, just very matter-of-fact. I wondered if his workman like attitude a product of the game coming easy to him. 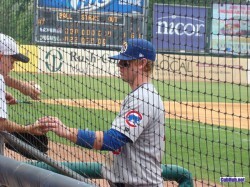 Also on the Peoria Chiefs was rookie catcher Michael Brenly, son of Cubs TV announcer Bob Brenly. Michael is a big boy. He is listed as 6’3″, 210 but I guarantee you he weighs more than that. He wasn’t overweight, just really thick. He looks a bit like Adam Dunn to me – a big powerful guy – but perhaps not quite as tall. Brenly is a catcher and took some nice cuts at the plate even though his season average is just .242. 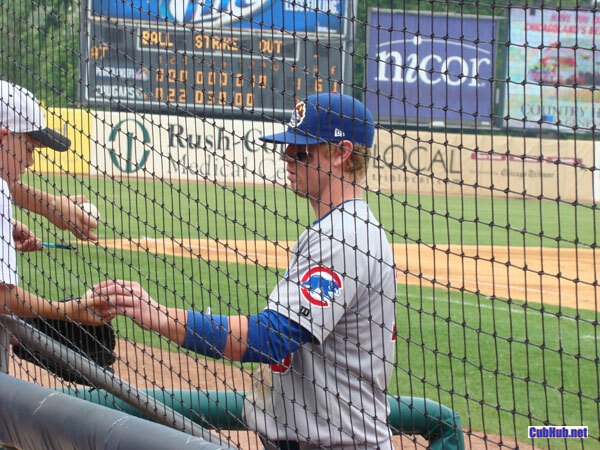 I noticed too that Michael Brenly was the only Chief to come back on the field after the game to sign autographs for kids. Obviously, he’s a class guy. Going to a Cougars game was really fun. I took my 6-year old son and we got to run the bases after the game. What’s not to like about that? Plus, twelve bucks a seat got me second row behind the visitors on-desk circle. Another five bucks got VIP parking. Minor league baseball is a great value.